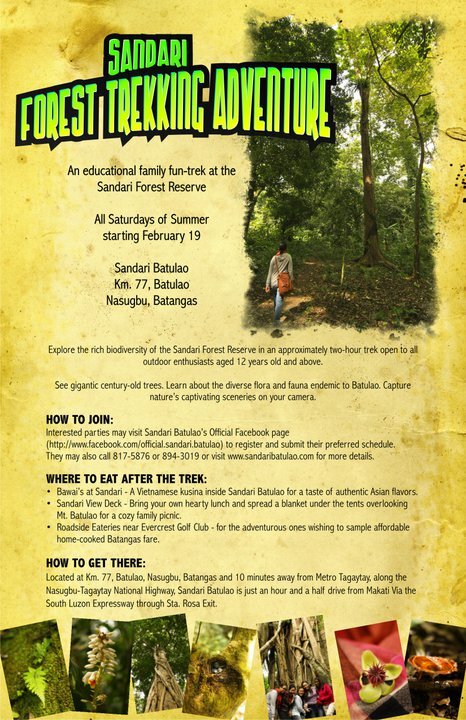 If you're still thinking where to go next month, why don't you try Forest Trekking Adventure c/o Sandari Batulao with family and friends. 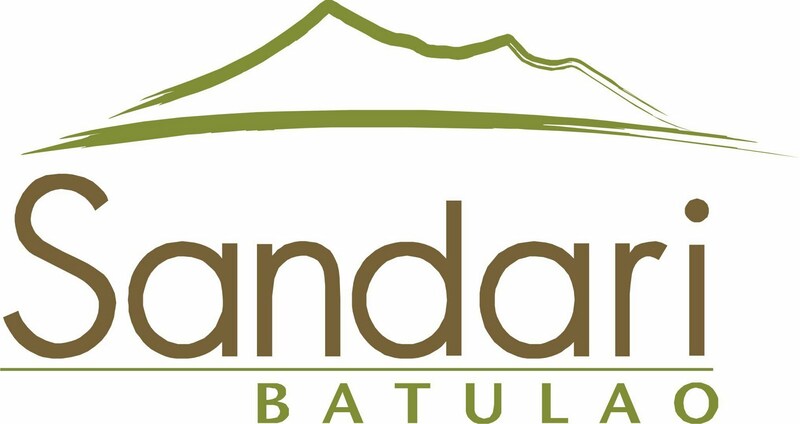 Sandari Batulao is a 800-hectare promising housing develeopment at the foot of Mount Batulao in Nasugbu Batangas. What's good about them is they tend to promote the different plants species, shrubs, and gigantic trees. A forest guide will be on hand to facilitate the trek, provide information about the plant life within the habitat and help maintain the safety of the participants. The event is free, no registration fee for joining so take this opportunity to embrace the lush & green picturesque view of Mount Batulao. Located at Km77, Batulao, Nasugbu, Batangas and 10 minutes away from Metro Tagaytay, along the Nasugbu-Tagaytay Tourism National Highway, Sandari Batulao is just an hour and a half drive from Makati via the South Luzon Expressway, through Sta. Rosa Exit. 1. Assembly will be at Nalé, Sandari Batulao, at 9:00 a.m.
2. Participants will be asked to sign a waiver before they will be allowed to join the trek. 3. Pregnant women, people with heart ailments and those with health conditions that forbid strenuous activities will not be permitted to join the trek. 4. Participants are advised to wear comfortable clothes and sturdy shoes. Slippers and high heels are not advisable. Long sleeved shirts and long pants are recommended to protect trekkers from protruding tree branches along the trail. 5. Participants are advised to wear insect repellent lotion. 6. Participants are advised to bring drinking water. 7. Smoking and littering are strictly forbidden inside the Sandari forest. Likewise, participants are not allowed to pick and take home flowers, leaves and other such items from the forest. To join, simply visit Sandari Batulao’s Official Facebook page (http://www.facebook.com/official.sandari.batulao) to register. They may also call 817-5876 or 894-3019 or visit http://www.sandaribatulao.com/ for more details. Mt. 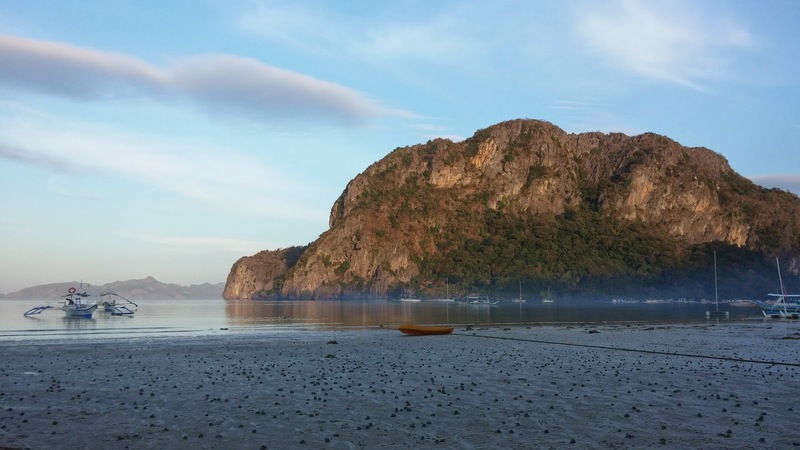 Batulao is one of my favorite hiking destinations... very picturesque! Hey CA! Mai here. I was planning to go there but wala pang may gustong sumama sakin. Pwedeng sumabay sayo? Hehe:) Nice blog. I followed it. :D More power! Aww..I can't make it on the 7th coz I have prior engagement. Sayang! But I tried signing up for May 14. :) Thanks! ai, gusto ko din toh m-try :) sana ok sa sked ko. I heard a lot of beautiful things about Bantangas in Cebu. I just wich I can get there this year;perhaps visit Sandari Batulao. Thanks for sharing your adventure. I wanted to say that it’s nice to know that someone else also mentioned this as I had trouble finding the same info elsewhere. Thanks for providing informative post. I am going to share and bookmark. Finally I am going to subscribe your rss feeds to check coming update on your blog. Wow. What a nice post. It really is some valuable info you're sharing with us. Keep writing good stuff like this and i bet you will have more and more visitors to your site. I will surely be one of them. They left the place very clean. I asked for the wood to be cut up into stump removal by Lewis Tree Service Inc firewood lengths, which they did. I also asked them to leave the smaller pieces so I could use them for kindling, which was also no problem.